A new A5 flyer describing the Gransden Lock N’ Pop offering has been publised. Click on the icon below for a copy. Duncan says: ‘we are seeing increasing interest in our offering and this flier is a vehicle to spread the word to companies who might benefit from using Lock N’ Pop’. W&H Marriages and Sons Ltd (www.marriagesmillers.co.uk) is a proud independent miller and has been producing flour since 1824. It operates from a site in Chelmsford where space is very much at a premium and it needs to stack pallets of bags of flour several layers high after production and before they are shipped to its customers. Mill Manager, Phillip Bunn, wanted to ensure that Marriages’ pallets were stable in storage and transit so that its customers could be confident that every delivery would be 100% complete and undamaged. Stretch wrap alone did not seem to be sufficient so he approached Gransden Packaging Line Products (www.gransden.org) for advice. 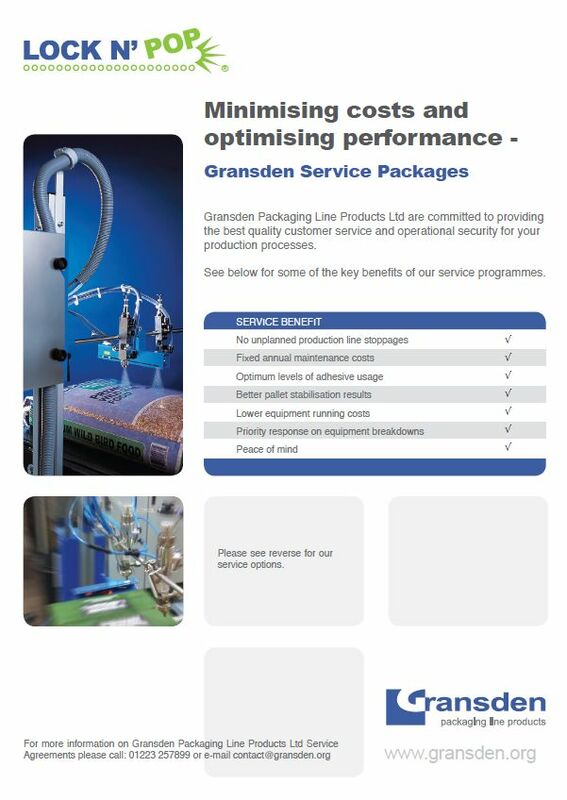 Gransden is the exclusive UK distributor of Lock N’ Pop pallet stabilisation systems and recommended that Marriages install a two headed automatic in-line system. This system applies a controlled quantity of Lock N’ Pop adhesive to Marriages’ bags. This adhesive is water based and has a high shear but low tensile strength which fixes the pallet load for lateral movement but enables easy lifting of bags from the pallet. Because of the unique formulation of the Lock N’Pop adhesive the bags themselves are undamaged when the bags are separated by the customer. 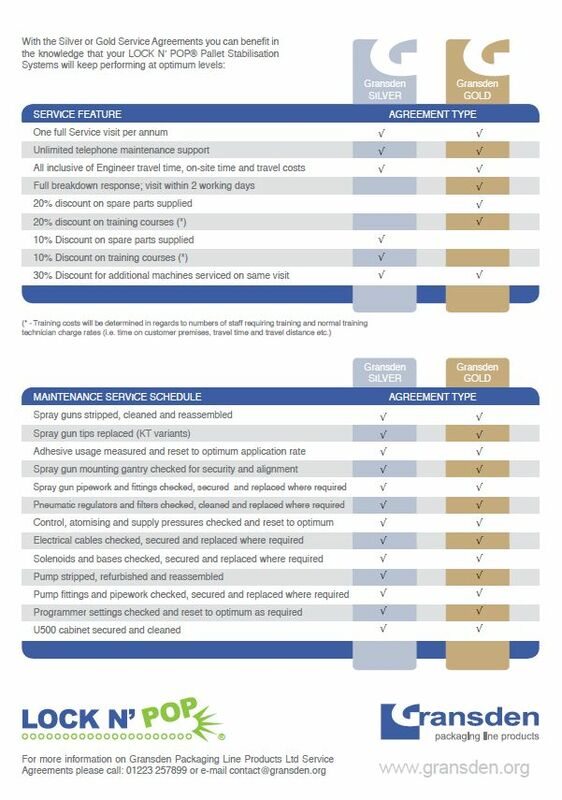 Click on the icon below for a pdf of this case study. 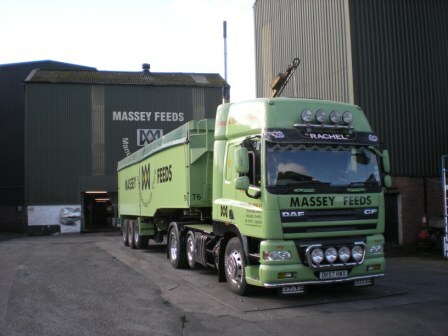 Massey brothers is a family owned manufacturer of a wide variety of animal feeds and agricultural products with 125 years experience in the animal feeds business. The company operates from two manufacturing sites located at Preston in Lancashire and Holmes Chapel in Cheshire. Additionally, the company sells its products through three company owned cash & carry outlets located at Longor and the two manufacturing sites in Preston and Holmes Chapel. The company manufactures around 27,000 tonnes of bagged feeds a year and the business is experiencing steady growth in demand for it’s products. The company has been quick to adopt new technologies and processes in order to increase it’s performance and has completely removed the need to stretch wrap outbound products by switching to use “Lock n’ Pop” stabilisation adhesives to stabilise palletised loads. 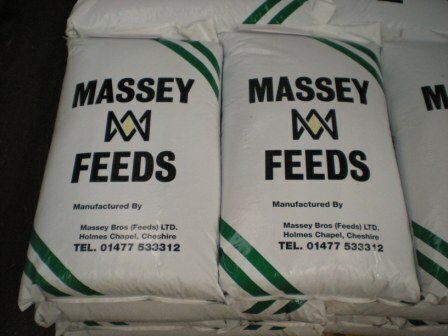 Animal feeds are sold in various pack formats but mainly in plastic sacks weighing 25 kg. Palletised loads weigh 1 tonne. A semi-automated wrapping machine was used and palletised loads had to be physically moved from the end of the production lines in each plant to the wrapping area prior to wrapping. The wrapping operation utilised 25 micron stretch film which was applied to the load in 12 wraps around the standard pallet. The company considered alternative wrapping methods and materials before deciding to trial water based stabilisation adhesives. Following successful trials the company adopted this method of stabilising it’s products. The only capital requirement of the change was installing the required spray equipment in-line at the point of palletising the load. The spray installation did not take up much space and as the adhesive is applied cold there is a minimal energy cost to operate the spray applicator. Once the water based adhesive is applied it quickly dries securing the sacks in place. The high shear strength of such adhesives holds the sacks in place during distribution but easily releases packs when picked from the load. Since switching from stretch wrapping of loads to using ‘Lock n’ Pop’ stabilisation adhesives the company has achieved it’s primary objective of streamlining the palletisation process by cutting out the need to stretch wrap it’s loads. This has reduced overall production time by 5 minutes per tonne. Carbon emission reduction of 34.2 tonnes p.a. Increased convenience for customers who do not have to dispose of waste film.